Trying to figure out the chain of ownership of the Cottage Studio in Norway, Maine is a challenge. 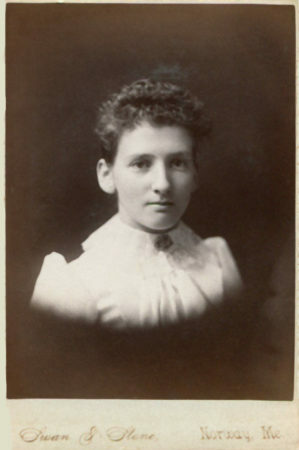 Minnie Libby ran the studio from late 1903-1947. Before that, her old mentor ran it at one point, along with Miss Libby’s former mentor, J.U.P. Burnham. Support for this project is provided by listeners like you. Check out my website at p3photographers “dot” net for ideas on how you, too, can become a supporter of the project. On today’s episode we take a quick look at an unusual story about a photographer from Norway Maine. For more information about any of the women discussed in today’s episode, visit my website at p3photographers “dot” net. That’s letter “p”, number “3”, photographers “dot” net. Today I want to give you just a quick look at a story I ran across when I was doing research for Miss Minnie Libby. The story has just a quick, brief connection to Miss Libby, because it’s really about what happened to a fellow photographer there in Norway, a man named John Wesley Swan. Dateline: Boston, December 8, 1893. 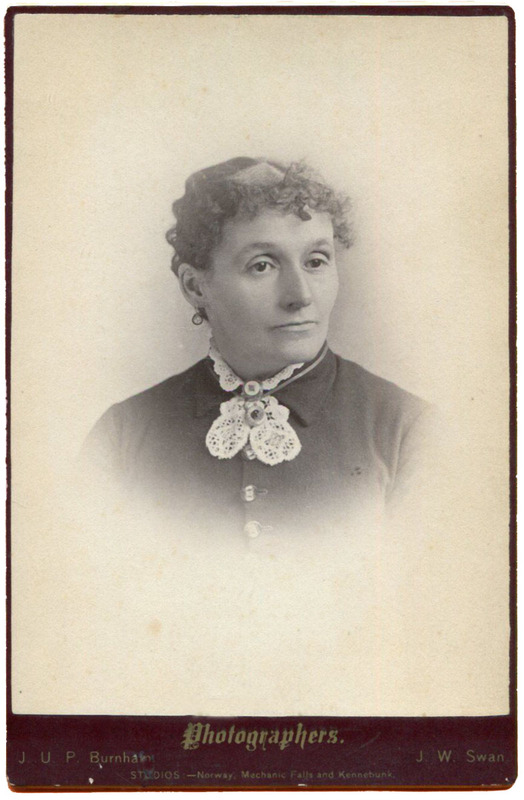 So, John Wesley Swan had been a photographer in Norway, Maine starting in the 1880s. In the mid to late 1880s he actually opened up a studio called the Cottage Studio with a man named J. U. P. Burnham. Now, if you’ve listened to the Miss Libby episode you may recognize that name. 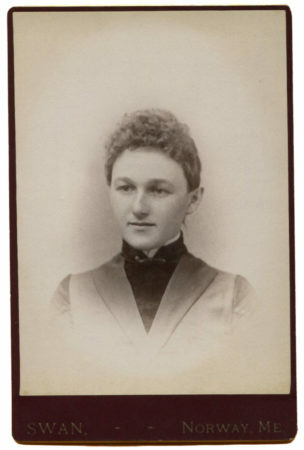 J.U.P Burnham was Miss Libby’s mentor. She started working for him as a photographer in 1882, eventually going off on her own in 1885. So Burnham and Swan run this Cottage Studio, but then by 1893, Swan has gone off on his own. He’s got his own studio in Norway, Maine, as well as another location in Island Pond, Vermont. At the time of his disappearance he’s actually a quite successful photographer. He doesn’t have any financial difficulties, according to the police investigation. His business is doing well, his home life is very happy — by all accounts, he and his wife are very happily married — and he adores — actually the newspaper article actually says “worships” his two children. He doesn’t have a business partner there in Norway, Maine, so there is no suspicion of foul play in terms of a personal grudge or anything, but the police decide that he has no reason to disappear on his own, either. The newspaper article that I found from the Lowell Sun in Massachusetts is actually quite extensive, because it was quite the curiosity that this photographer disappeared. In 1894 they do a follow-up story, and they say, you know, that was never solved, they never did find a body, but foul play is definitely suspected, because there was absolutely no reason for him to have disappeared. But then I ran across an article from 1896. Now, as I said, he had at a location in Norway, but he also had a location in Island Pond, Vermont, too. So there was an article .. well … let me read it to you. This is from March 1896. J.W. Swan, a photographer of Island Pond who suddenly disappeared many months ago [nb. it’s actually been since Nov 1893] has been heard from! He is in Texas, and he writes to his friends that he is ignorant of all that happened to him after leaving Boston until he found himself in New Orleans and ill. After regaining his health, he went to Texas, where he’s following his old occupation. He has written for his wife and children to join him. Well! I did not see that coming! So, the story that he tells people is that he was robbed there in Boston. And somehow he winds up waking up without his memory in New Orleans, and he’s sick, so it takes awhile to recover. But he’s got amnesia, and so [when he is better] he wanders to Texas and becomes a photographer. And then apparently, at some point in the early part of 1896, he regains his memory, and he writes to his wife, and says, I’m a photographer here. come join me and bring the kids. Well it doesn’t quite work out that way, because the next thing you know, he is back in Norway, operating the rebuilt Cottage Studio with a man named Clarence Pike. Now, you see, while John Swan was gone, in 1894, there was a big fire — it’s called the Great Fire of Norway, actually, and a lot of the businesses in town were destroyed or partially destroyed by the fire. 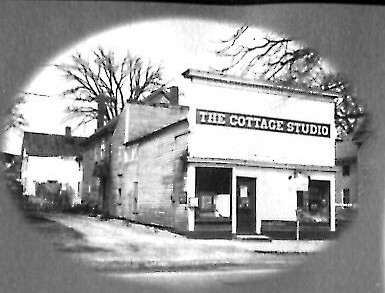 The Cottage Studio was one of them, and that is rebuilt by this photographer named Clarence Pike. And Pike and Swan wind up running the Cottage Studio starting in late 1896 [nb. apparently]. The people in Norway were not quite sure what to make of John Swan’s story. They did think that maybe there was more to the story than he got amnesia and then conveniently remembered how to be a photographer there in Texas, but not who he was for a while. But people didn’t have any specific evidence to point to [to challenge the story] … and they did like his wife and kids … and his wife took him back. In 1900, his wife and children are still living with him in Norway. He is at that point running his own studio again, very successfully. And so apparently the people in Norway, even though they might have been skeptical about the story, they forgave him. He ultimately has a bit of bad luck, though. His studio burns down in 1900, and he moves to Montreal. Now, he was actually Canadian originally, and so he just is moving back to where he was from. His brother had actually come from Montreal back in 1893 to help the police search for him in Boston [so he still had some family up there]. 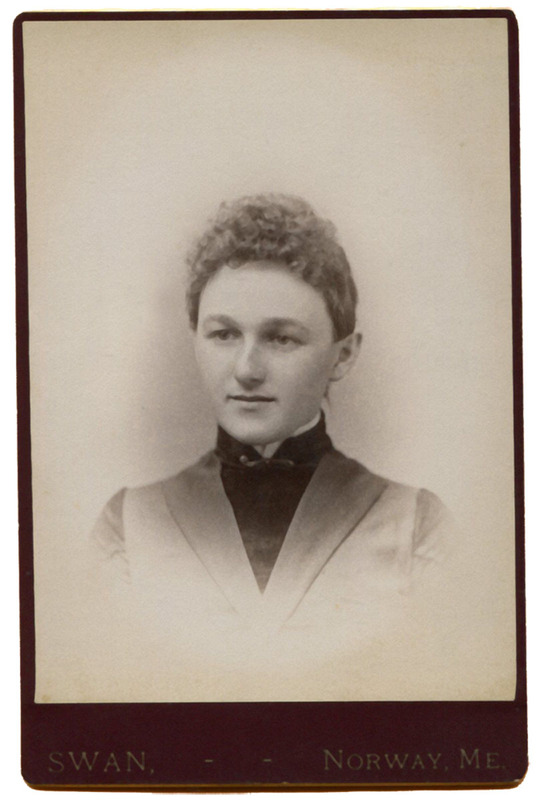 Anyway, he and his family moved to Montreal in 1900, where he is a successful photographer until his death in 1913. It’s really kind of an incredible little story. And I like how there are these little side connections with Miss Libby. Remember, Burnham and Swan were the first proprietors of the Cottage Studio in the mid 1880s, and Miss Libby, of course, had worked for Mr Burnham. And then Pike and Swan were the proprietors of the Cottage Studio after 1896. until Swan goes off on his own. But the funny thing is that Pike continues to own that building until 1903, when he rents it to a man named Wiggins Merrill. But then ultimately, of course, Pike sells it in 1903 to Miss Libby. Anyway, I just want to bring this up because this is the kind of story that I sometimes run across but can’t quite work into my main narrative. But I do find it incredible that you can find all these curious stories in the old newspapers. By the way, on my website I’ll put up a couple of examples: one by Burnham and Swan, one by Swan alone. Like Miss Libby, these men were all successful everyday photographers, running studios and taking pictures there in Norway, Maine. Well, that’s it for today’s “Extra” on John Wesley Swan and his strange disappearance in 1893. As always, check out my website for other information and updates at p3photographers “dot” net. Or drop me a line, at podcast “at” p3photographers “dot” net, and let me know if you have any questions or concerns about strange stories that you’ve run across that you’d like to hear profiled here on podcast. You can also check out my Facebook page at facebook.com/p3photographers. Well, I hope you’ve enjoyed this foray into something that wasn’t purely a woman photographer.